Good Friday: to some, it’s nothing more than a strange tradition marking the death of a religious figure. To others, it’s a powerful symbol of forgiveness and grace. 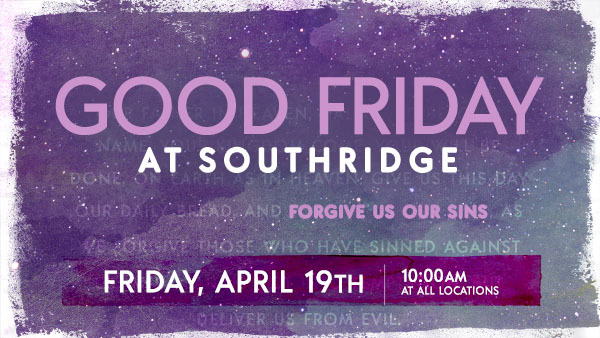 Maybe you’ve never been to a Good Friday service, or couldn’t imagine attending church twice on one weekend (if you’re already coming for Easter), but Good Friday is such a meaningful experience for our community and just might be a time of (extra) ordinary revival as we encounter the love and grace of the cross. We invite you to join us at 10:00am across all three locations, as we look to Jesus to “forgive us our sins” through song, story, and communion.